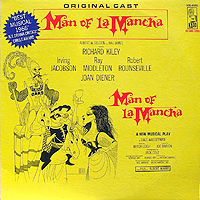 Original London Cast, 1968 (Decca, 2LPs/no CD) (3 / 5) While this is not really a “complete” Man of La Mancha, the two-LP set does give us a vivid sense of the show through its inclusion of much dialogue and some nice sound effects. Keith Michell is almost as magnificent a Cervantes/Quixote as the role’s creator, Richard Kiley. Joan Diener is back as Aldonza, but her performance here is extremely mannered and lacking in spontaneity; it sounds as if she had given up on playing the character, having decided instead to deliver a star turn. 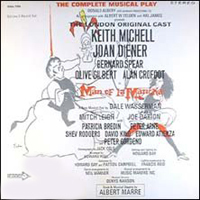 Despite this major caveat, the London Man of La Mancha deserves a CD release: The supporting cast is fine, especially Alan Crofoot as the Padre, and the sound quality of the recording is excellent. Another plus is that we get to hear that wonderfully scary Inquisition theme more than once. — M.P. Film Soundtrack, 1972 (United Artists/Varese Sarabande) 0 stars; not recommended. What a disaster this is. 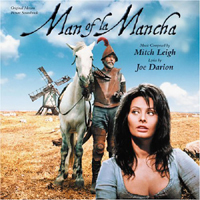 On paper, Peter O’Toole and Sophia Loren would seem like excellent casting for a film version of Man of La Mancha, providing that their singing voices were skillfully dubbed by others. Alas! Simon Gilbert, who ghosts for O’Toole, has a nice enough voice but very strange mannerisms of enunciation; just listen to him sing the lyric “thou art base and debauched as can be,” hitting every “b” with a sledgehammer. As for Loren, she was unwisely allowed to do her own singing and the results are borderline embarrassing. Her voice has about one-third the range required for Aldonza’s music, and her weirdly modified Italian accent is a further liability. Up against these two, James Coco manages to retain his dignity as Sancho, although he sings his part in “I, Don Quixote” down the octave from where it’s written. Ian Richardson has far too thin a voice for the Padre, but this is a moot point, as the beautiful “To Each His Dulcinea” has been cut. The one good thing about this recording is that the orchestrations for symphony-sized forces were done skillfully; it’s nice to hear strings playing this score, even if the original orchestrations for a much smaller band remain superior. — M.P. Studio Cast, 1972 (Columbia/no CD) (1 / 5)This recording was only briefly in print, and it’s hard to find nowadays. Jim Nabors, famous as the star of the 1960s TV sitcom Gomer Pyle, USMC, possessed a legit baritone voice that gave him some additional career mileage. But his sound is affected and ponderous to the point of camp — certainly not the effect that a good Cervantes/Don Quixote is supposed to make. The Aldonza here is superstar opera diva Marilyn Horne in a frustrating performance; her magnificent mezzo is right for the role, but she sings “It’s All the Same” and other songs so squarely that they make little impression. (This is surprising, as Horne has done very well with musical theater material on other occasions; perhaps she was under-rehearsed.) By far the best of the three principals is Jack Gilford, a wonderfully endearing Sancho. 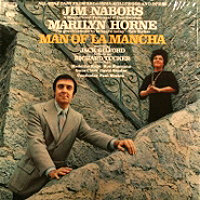 The supporting cast — Madeline Kahn as Antonia, Ron Hussman as the Innkeeper, and the great opera tenor Richard Tucker as the Padre — is uniformly excellent and the original orchestrations are wisely used, but the unsatisfying performances of Horne and especially Nabors make this album little more than a curiosity. — M.P. 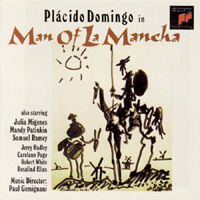 Studio Cast, 1990 (Sony) (1 / 5) There’s nothing terribly wrong about this recording aside from the presence of the outrageously mannered Mandy Patinkin as Sancho Panza. But, somehow, the whole thing doesn’t jell, even though the original orchestrations are expertly conducted here by Paul Gemignani. Opera icon Placido Domingo sings Quixote’s songs with all of the glorious tone you’d expect, but his Spanish accent is distracting — even though he is playing a Spanish character. (This is, after all, an American musical.) Julia Migenes is well cast and has many fine moments, but her performance isn’t as mercurial as Joan Diener’s on the original Broadway recording; she just doesn’t use her chest register in the same full-out way as Diener. Jerry Hadley does a good job as the Padre, but though Samuel Ramey at the time possessed one of the most voluminous bass voices in operatic history, it’s not a voice that’s appropriate to the Innkeeper — or, really, to any other musical theater role. 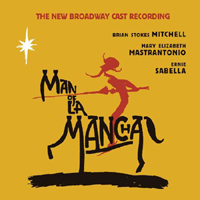 This isn’t the worst recording of Man of La Mancha, but it’s far from the best. — M.P. Broadway Cast, 2002 (RCA) 0 stars; not recommended. To say that Brian Stokes Mitchell does not have the range for Cervantes/Don Quixote in Man of La Mancha is to put it mildly. Mitchell possesses an impressive baritone, but his singing style is ill-suited to this dual role; he annoyingly slides off of notes like a pop/jazz singer throughout this recording, and his grandstanding rendition of a foolishly extended version of “The Impossible Dream” is off-putting. Even less successful is his delivery of the dialogue that’s included here. When playing Cervantes, Mitchell sounds like a genial TV-sitcom actor; when he morphs into the Quixote characterization, he assumes a laughably ponderous tone. Also miscast are most of this production’s co-stars and supporting players. As Aldonza, Mary Elizabeth Mastrantonio displays a beautiful soprano voice when she doesn’t have to push (as in the moving “What Does He Want of Me?”), but there are some harrowing moments when she switches vocal registers to negotiate the more-challenging sections of the score (as in the final measures of “It’s All the Same”). And her delivery of dialogue is just as giggle-inducing as Mitchell’s, although for a different reason: This Aldonza sounds as if she comes from Brooklyn. Ernie Sabella as Sancho Panza has so much trouble with breath support that he chops up phrases willy-nilly. On the other hand, Mark Jacoby has the vocal goods for the role of the Padre, and Don Mayo sounds fine as the Innkeeper. It’s ironic that one of the best singers in the show, Stephen Bogardus, has very little to sing as Sanson Carrasco. One final reason not to bother with this recording: It doesn’t include the show’s exciting overture! — M.P.